The Ruby of our chocolate drops. Free from artificial colouring and fruit aroma the chocolate will enchant you with it's sweet fruit aroma. They are ideal for mueslis, pralines and co.
With our Ruby chocolate drops you might get the feeling that you're seeing everything through rose coloured glasses. Ruby chocolate is brand new to this world - it's the fourth natural chocolate colour: pink. So you can take off your rose coloured glasses and just enjoy! 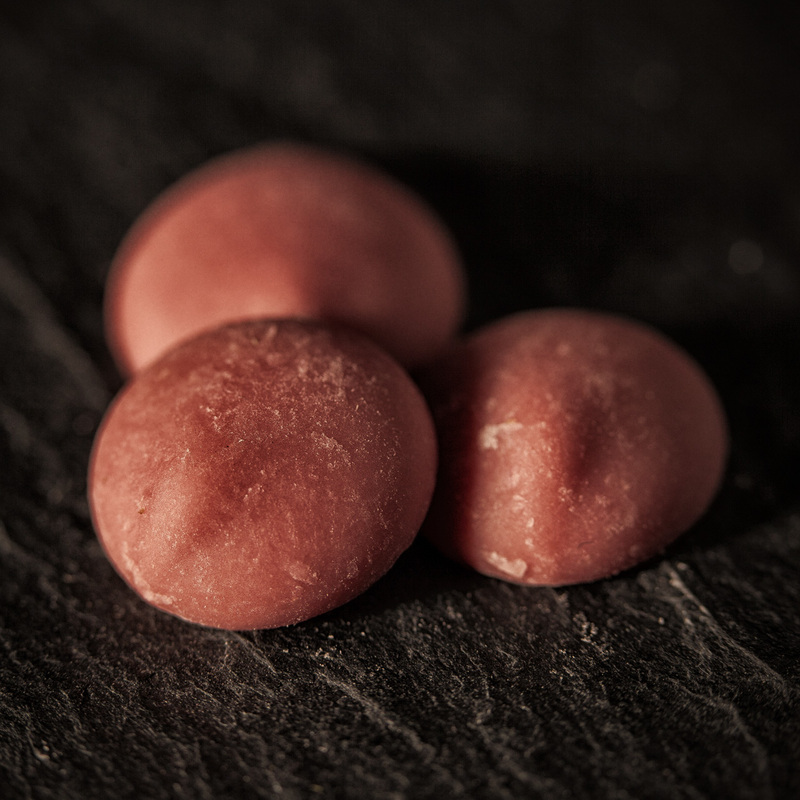 Our chocolate drops are not coloured, they are pink by nature.The colour comes from the very rare Ruby cocoa bean. The bean is not only responsible for the pink colour but also for the pleasant acid and fine fruity note, which reminds of berries. The bean was undiscovered for a long time and kind of got lost within the cocoa mix. That's why it's important to use the correct bean for the correct cocoa tree. Unfortunately they are very rare and are only growing in Ecuador, Ivory Coast and Brazil. In combination with the right fermentation you get a chocolate play of colours. 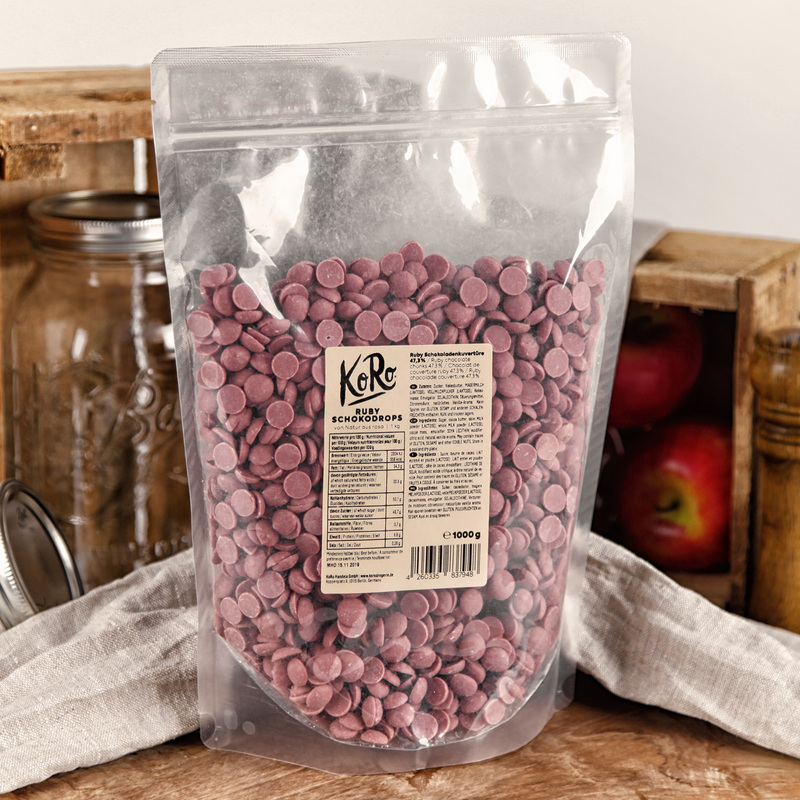 Our Ruby chocolate has a cocoa content of at least 47,3% and they have a creme and easy to melt texture. That's why they are perfect for making your own pralines, frosting or as coating for you dates. They are also an eye catcher for your muesli and the perfect colourful start into your morning. With every kilo bought, one Euro goes to the non-profit organisation "Cocoa Horizon Foundation". They actively engage in the financial supporting of cocoa farmers. The big target is a sustainable cocoa cultivation. Projects are for example a manufacturing without deforesting, the supporting of farmers and the elimination of child work as well as assisting women. Is Ruby Chocolate white chocolate with artificial colouring? No. Ruby chocolate is pink because of the natural colouring of a rare cocoa bean verity.